As Human Beings, we unconsciously allocate a certain amount of distance between others and us. We leave larger gaps for strangers, and smaller gaps for friends. Currently, no Social VR system takes into account the ability to control our physical boundary space around us. Never before Virtual Reality, have we had to design with this in mind. 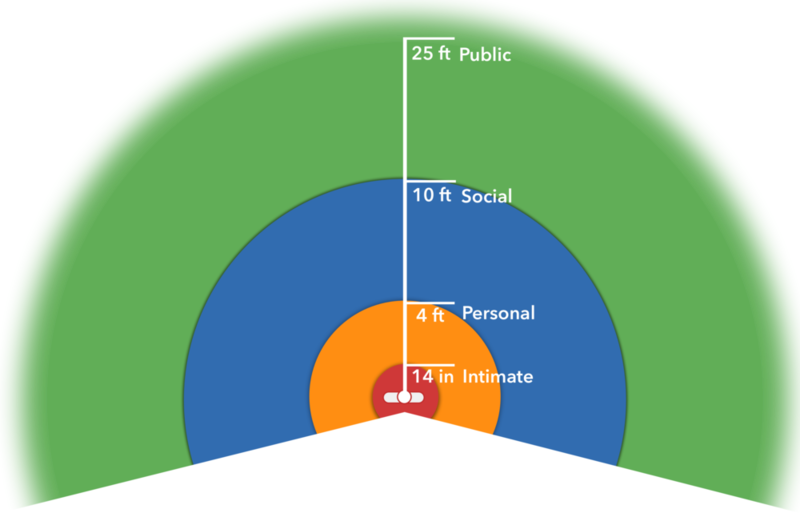 By building upon decades of research on Proxemics, I have devised a model for AltspaceVR to have default Privacy Bubble space restrictions for strangers, which can be customized per users' comfort level. By "Following" or "Friending" another user, the friend can be granted access to a closer reach of the user, for more intimate conversations, just like real life. Building a privacy protocol like this stems from decades of research done on comfort levels of communication and interpersonal space. Participants walked around the room with the virtual person standing still. Participant stood in a VR room where the virtual person walked towards them. In both experiments, the participant's gender, virtual person's gender, virtual person's gaze behavior (matching the participants' eye gaze, vs closed eyes), and whether that other virtual person was allegedly controlled by humans (i.e., avatars) or computers (i.e., agents) were varied. By measuring the participants’ behaviors, including interpersonal distance, memory, and self-reported social presence and affect ratings, they found that participants clearly treated virtual humans in a manner similar to actual humans. Distance Kept: Average minimum distance was ~0.5m away which shows that participants did not violate the virtual human's Intimate space. In addition, the shape of the Privacy bubble closely resembled real life Proxemics zones with the bubble being much smaller behind the target virtual human, than in front. Agency: participants recalled the information on the virtual person's body more effectively when the virtual person was associated with an actual human being (Avatar vs Agent condition). More research analysis to come. In today's VR Social Environments (ie: Altspace), spatialized audio limits its users to be in a close range to be able to communicate clearly. To apply the Proxemics Borders to such a system, I have edited the borders to a simplified version which accounts for speaking to strangers, but still protecting you from people coming too close into the Intimate Zone. Through my own experiences in social environments, my observations led to me disregard the borders behind my back. It is less uncomfortable for someone to be standing closely behind me than standing in front of me. By combining the research and our intuitive experiences, I propose that by two users mutually "Friending" or "Following" each other, they give each other access to each other's Intimate Zones. Visualizing Data is not a simple process. These draft demonstrate my thinking process of how to translate the information from a list of zones, to a simple coherent infographic that anyone can understand. Version 2: Fixed scalings of circles, blurred out the last circle because it's boundary goes to infinity. Bailenson, J. N., Blascovich, J., Beall, A. C., & Loomis, J. M. (2001). Equilibrium revisited: Mutual gaze and personal space in virtual environments. Presence, 10, 583-598. Blascovich, J. (2001). Social influences within immersive virtual environments. In R. Schroeder (Ed. ), The social life of avatars (pp. 127- 145). New York: Springer-Verlag. Mehrabian, A. (1967). Orientation behaviors and nonverbal attitude communication. Journal of Communication, 17, 324-332.